2. MCA project was taken over from the previous vendor and INFY found that there was very little documentation and INFY had to do it from the beginning. 3. INFY has been maintaining CPC site for the past 10 years and it has been running smoothly. Union Cabinet’s decision to select Infosys as a developer and allot Rs.4242 crores-worth project of creating Income Tax’s Centralised Processing Unit has raised many eyebrows in the Information Technology (IT) sector as well as others, considering the chaos created by Infosys in developing the system for Goods and Services Tax Network (GSTN) and the Ministry of Corporate Affairs (MCA)’s company registry. Many are wondering why Government again selected Infosys, for it does not have a great record of executing projects for the govt. Every player in the IT sector wonders how like a cat always landing on its feet, Infosys manages to bag contract after contract. People in the know feel that this is simply due to the “rapport” of Infosys founding-partner Nandan Nilekani with the NDA Government headed by Prime Minister Narendra Modi. Every company owner in this country has experienced pain when MCA registry contract passed hands from Tata Consulting Services (TCS) to Infosys. TCS had done a good job of it till mid-2014. Once Niti Aayog CEO Amitabh Kant lost his cool and blasted Infosys for ditching the administration of MCA’s Company Registry. Infosys, which won the GSTN contract by outsmarting L & T InfoTech was a real pain for every taxpayer of GST. When GST went live on Jul 1, 2017, the software was undercooked and as a result, the country suffered. Even basic problems in uploading were not rectified by Infosys, for which it bagged a hefty contract of more Rs.3500 crores. The question that keeps cropping up is why this government keeps rewarding shoddy implementation by Infosys? And what remedial actions were done by Infosys to fix these flaws? Did the government fine them? The Modi-led Government ended up being at the receiving end of the chaos and faults of software implementation in MCA and GSTN. 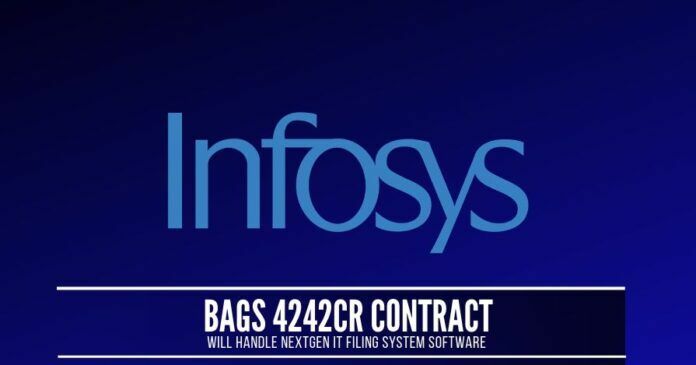 The new project given to Infosys is worth Rs.4242 crores. It concerns every taxpaying person and is bigger than GSTN and MCA. It would help if the government comes out and transparently reveal the reasons for granting this contract after their continued failures. The government said on Wednesday said IT major Infosys will develop the next-generation income tax filing system for Rs 4,241.97 crores which will cut down the processing time for returns to one day from the current 63 days and expedite refunds. The Cabinet, chaired by Prime Minister Narendra Modi, gave its “approval to expenditure sanction of Rs 4,241.97 crores for Integrated E-filing and Centralised Processing Centre 2.0 Project of the Income Tax Department”, Union minister Piyush Goyal said. Briefing media about the decision, he said the processing time at present for Income Tax Return (ITR) is 63 days and it will come down to one day after implementation of the project. Goyal said the project is expected to be completed in 18 months and will be launched after three months of testing. Infosys, he said, has been selected to implement the project after the bidding process. Every player in the IT sector wonders how like a cat always landing on its feet, Infosys manages to bag contract after contract. BJP had no qualms adopting Nilekani’s Aadhaar Project, implemented during the Congress regime, even without any proper legislation. What is interesting is that even the Opposition (Congress) is silent on Nilekani’s (Nandan Nilekani was Congress candidate in 2014 Lok Sabha elections) firm’s failures while executing projects that affect the public at large. Even MSM is soft on Nilekani – could it be because he is running a trust for giving good scholarships to journalists? Nilekani and controversial historian Ramchandra Guha run a trust named as The New India Foundation, which awards good money to many journalists for the past decade. Sir , when it come to Govt and pvt Indian MNCs , it’s a charity and colluded looting . Whether it’s DRDO giving subcontract to or other Dept’s giving contract companies like like Infosys ,TCS ,L n T, Tech Mahindra, Reliance . If you see contract terms they are very tough and seems like drdo and govt have strict grip only to manage bribe n profit for vendor. Don’t put all your eggs in one basket. If the basket size and its capacity to bear the burden is not an issue. If two or more baskets are used load would be evenly distributed. Can it come under the purview of competition law of India? In Modi government’s parlance it is called “ease of doing business”!! Even after creating chaos in Company Registry & GSTN, Infosys bags Govt. contract worth Rs.4242 crores for Income Tax processing project. We have under gone pain for six months, call center did not respond and officers were confused to dish our clarifications.But many paid “penalty” for ………..not aware of Infy paying penalty on their disastrous performance bring down the image of the government. Of course NDA-Non disclosure agreement comes into play!! As on date six crores tax payers are paying taxes.After 18+3 months Infy may catch up with Kapil Sibal’s ZERO…….tax payers……!!! In my experience TCS has a better team than Infy. I feel that GOI selected Infy on L1…lowest bidder basis. Bidding is bad. E-tendering is preferable. Nandan’s tom foolery is amazing. This post has something to say. But doesn’t have the data to make complete analysis. Should have mentioned, who were in Fray, why the lost, how companies make false promise and fail. On what clauses other bidders were out smarted? Is there a penalty clause for failing to implement well in time. These data have to be provided as well.